This week I decided to contrast this cold weather with a character who spends her time in water…. a summer pass time for most of us. It’s super cold outside where I live, and I am dreaming of my upcoming cruise, so Ariel is on my mind with her warm waters and Calypso band. 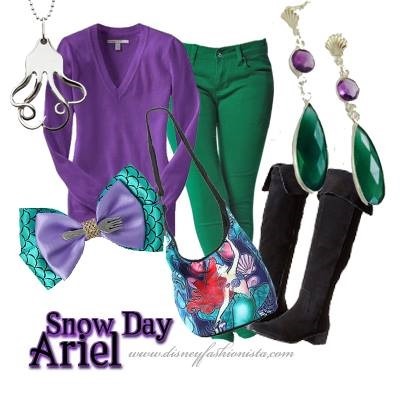 We are going to add a twist to this week’s character though, and make her a snow day Ariel! Let’s take a peak at a Disney Bounding look that includes not only the outfit and accessories but nails and makeup too! Snow day Ariel is a practical take on this amazing character for this time of year and I think she would be pleased with what we came up with. Ariel’s classic color palette includes mostly green and purple because, let’s face it, all she really wears when she’s her mermaid self is a purple shell bikini top! This look starts with the basic green skinny jeans paired with a classic long sleeve purple sweater. The exact colors Ariel is known for. We add black, suede boots that are reminiscent of Prince Eric’s boots, I think! The outfit is very colorful but lacks texture or pizzazz at this point and that’s where the rest of the look comes in. A mermaid hair bow and a Little Mermaid purse from Hot Topic add some fun flash to this look. Now for jewelry. A necklace representing an octopus, aka Ursula, can be found at sandcastlesavon.com and is perfect for adding in this villainous creature to another wise perfect princess look. The fabulous earrings are from Beautiful Baubles! The seashell ear posts are an extra added touch to these already amazing Ariel earrings. If you are interested in these earrings, Check out Beautiful Baubles and use discount code disfashion5 for a 5% discount! The fabulous Katelynn Rose has given us a new look this week for our red head, blue eyed beauty. The look is also based around her classic color palette of purple and green. 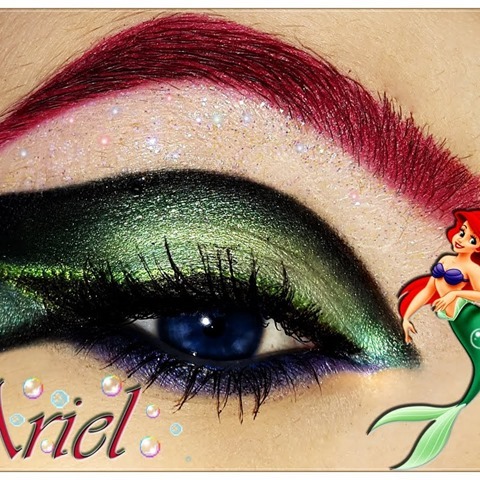 I love the fact that the shimmer and blending that is done, with the green tones, and the fact that the way it is outlined almost looks like a mermaid tail, in my opinion. If you are interested in attempting this look, check out the instructions below. The nails are clearly mermaid inspired with the scales and wavy lines. The colors include the purple and green as well as some pink and blue to add some extra fun. 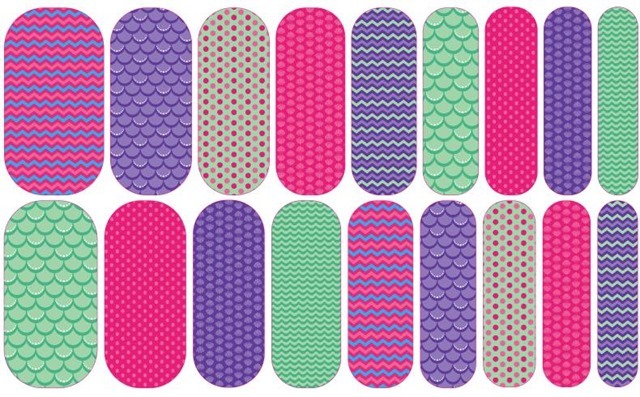 These nails have been created exclusively for us by Micheal, the exclusive Jamberry rep for Disney Fashionista. If you are interested in obtaining this fabulous look for yourself, contact Micheal at [email protected] and she will hook you up! Tell her what you’re looking for and she may have other looks that inspire you, too! That brings us to the conclusion of another week here at Disney Bounding with the Disney Fashionista. I hope the thought of a character from a warmer climate dressed in warmer clothing, warms you up a bit in this cold season. Let me know what you think of this week’s look in the climate box below!